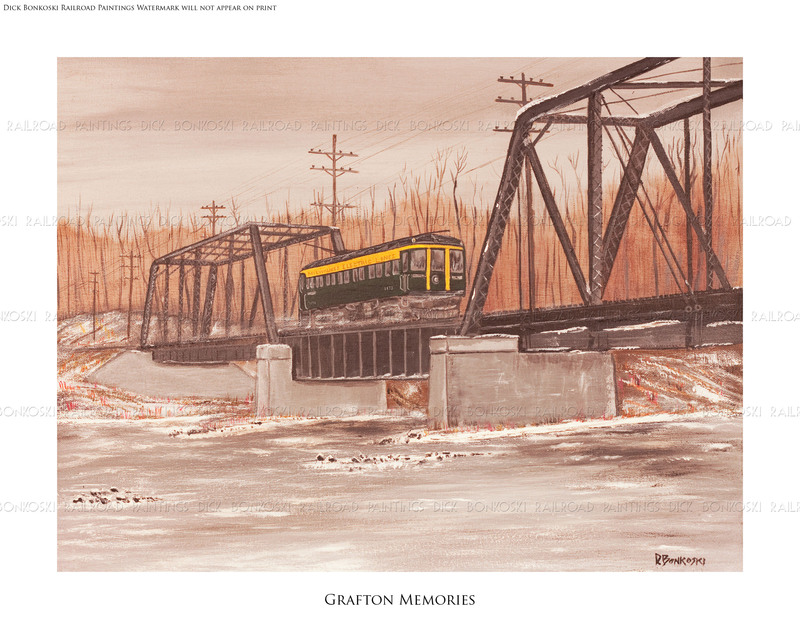 Southbound from Port Washington on the last day of operation of former Milwaukee Northern trackage, a Milwaukee Electric interurban rumbles over the Milwaukee River bridge near Grafton Wisconsin in 1948. These through-truss spans were nearly 100 years old and were built in the 1850’s for the Michigan Central Railroad and were purchased second hand for $5,722.00 by the Milwaukee Northern in 1906 and moved to there new home over the river where the served until the discontinuance of the line on March 28, 1948. Today, pedestrians and bicyclists can traverse the line of the former Milwaukee Electric Railway & Light Company (TMERL) as it dissects the farmlands and neighborhoods that boarder the line. The depot in Cedarburg still stands looking as good as it did in the heyday of interurban railroading. 16 X 20 original acrylic painting was completed in 1989.